Nestled in the foothills of the Austrian Alps stands the historic fourteenth-century Carthusian Charterhouse in Gaming. Since medieval times, the monastery has weathered the storms of history. It has seen good times and bad; stability and revolution; peacetime and war. Thus, the Charterhouse was a fitting site for Seventh International Student Summer Conference (Université d’été) hosted by the Tradition Family Property (TFP) organizations in France and Austria from July 29-August 3, 2007. Over 130 members, students and friends attended from all over the world. 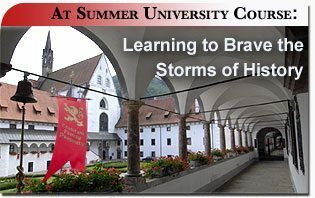 The theme of this year’s six-day summer program centered on those very storms of history which the Charterhouse has managed to survive. It dealt with the militancy of the Church in temporal society in face of Her internal and external enemies and especially those enemies that threaten the Church today. Indeed, something of this struggle seemed to be in the air during a conference ceremony that took place inside the large vaulted chapel. While outside there was wind, rain and lightening,inside the medieval chapel four young men – two Americans, one Irishman and one Paraguayan – made the decision to dedicate themselves as members in their respective TFPs. The raging storm outside seemed rather symbolic of the hostile elements that so surround the Church, while inside he chapel, calm and peace reign under the protective mantle of the Blessed Mother. In fact, the featured special guest at the TFP conference was the Blessed Mother herself, as represented by the International Pilgrim Virgin Statue of Our Lady of Fatima, which graced the event with its presence. A continuous vigil of prayers was held throughout the statue’s stay, where all asked for Our Lady’s blessings and those of her Divine Son for all the activities of so many TFPs around the world. National delegations greeted the statue with traditional hymns from their respective countries. All conference participants were particularly honored by the presence of Bishop Juan Rodolfo Laise, Bishop Emeritus of San Luis (Argentina) who celebrated daily Mass and delivered fiery sermons. Prince Luis of Orleans-Braganza from Brazil and Duke Paul of Oldenburg (Germany) were among the special honored guests who delivered inspiring talks. The core program of the course consisted of a number of well-prepared talks simultaneously translated into seven languages based on the historic perspective of the book Revolution and Counter-revolution by Prof. Plinio Corrêa de Oliveira. Speakers from several TFPs and other esteemed guests delivered timely talks around the central theme of the militancy of the Church in temporal society in face of internal and external enemies. Thus, they focused on the Islam, Protestantism, the French Revolution, and the Communist Revolution. However, the conference was not limited to just history. The Culture War was also analyzed and participants were invited to apply the lessons of history to the present day. Prof. Roberto de Mattei, president of the Rome-based Centro Culturale Lepanto, qualified this application as a veritable modern crusade and called Prof. Plinio Corrêa de Oliveira, the crusader of the twentieth century. “The Moral Profile of a Counter-revolutionary” by Jose Antonio Ureta stressed a Catholic spirituality based on Abbot Jean-Baptiste Chautaurd’s The Soul of the Apostolate as the secret to truly effective action. Another talk stressed the importance of the Blessed Mother in this great struggle for Christian civilization. Throughout the course, study workshops were scheduled where participants reviewed the talks, asked questions and discussed matters in depth. Studies was only part of the academic experience. The rich cultural and Catholic tradition of Austria provided excellent opportunities to understand better a Christendom long gone. Whether it was the organ and trumpet concert at St. Florian’s Abbey, a visit to Vienna’s Hofburg Palace, or a boat ride down the Danube River, participants gained a better understanding of the splendor and beauty of Christian civilization. A seventeenth century period costume falconry demonstration was especially appreciated as was a dinner at a traditional Vienna beer house. 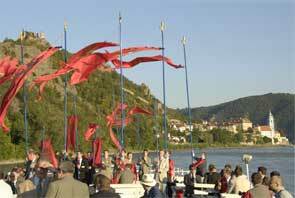 The boat ride down the Danube River was an opportunity to gain a better understanding of the beauty and splendor of Christian civilization. Throughout it all, the national delegations mixed and formed friendships. Germans, Austrians, Polish, Americans, Englishmen, Italians, Brazilians and so many others met in Catholic fellowship around a single ideal – the restoration of Christian civilization. As an example of Counterrevolutionary action, American TFP members gave a special presentation on its Public Square Rosary Campaign, which aims to organize over 2,000 public rosary rallies nationwide on October 13, the 90th anniversary of Fatima’s miracle of the sun. The Université d’été represents an excellent initiative on the part of the TFP organizations in Europe. Superb organization and coordination ensured that all could concentrate on the matters at hand. Decoration and attention to detail created a truly Catholic atmosphere. 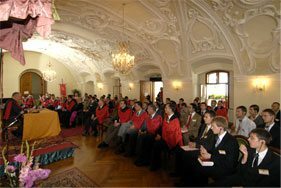 Amid the joy of being together at such a site, the final banquet held at the ornate Prelate’s Hall served to remind attendees of the purpose of the International Student Summer Conference. All were invited to develop a counterrevolutionary camaraderie having ever-present the tragic background of the crisis inside the Church and society. As a representative of each delegation delivered a short commentary on his impressions of the course, all were reminded that with the Cultural War raging, there is no one who is not involved. As Duke Paul of Oldenburg noted so well in the closing remarks, like Prof. Plinio Corrêa de Oliveira, who, when still young, marveled at the ruins of Christendom, the participants where asked not only to marvel at these ruins, but to make of their restoration, the future. This entry was posted in Events of 2007 and tagged Bishop Emeritus of San Luis (Argentina), Bishop Juan Rodolfo Laise, Blessed Mother, Carthusian Charterhouse, Cristian Civilization, cultural experience, Gaming Australia, Germany, Learning to Brave The Storms of History, militancy of the Church, Prof. Roberto de MAttei, Revolution and Counter-revolution by Prof. Plinio Corrêa de Oliveira, temporal society, TFP's Seventh International Student Summer Conference, The Soul of Apostolate by John Horvat II. Bookmark the permalink.